Find the next post in this series here or go to the previous post. Students will often latch onto the superficial similarities of diagrams and representations that we use in teaching science. This arises largely students' lack of exposure to the deep underlying conceptual structure of the discipline. We don't become experts overnight! Students need help understanding when a particular representation is right for the task they are working through. Helping them understand why a particular representation is effective and how it invokes concepts from within the discipline is a must! This Flash Point asks students to reason about aromaticity, acid/base stability, and Frost circles to understand why cyclopenadiene is many orders of magnitude more acidic than alkanes or alkenes. Mechanisms can be downloaded in the Itunes App store or Google Play. Web version is also available upon request. Frost Circle representations available for download. Diagram 1, Diagram 2. Provide some background for students about the known acidity of protons in alkanes and alkenes. Namely, hydrogen atoms in alkanes and alkenes are not considered to be functionally acidic without the presence of strong electron withdrawing substituents adjacent to the proton. Explain that tabulated values estimate that the pKa value of an alkane hydrogen is about 50 and the pKa of an allylic hydrogen is about 43. Contrast this, for example, to H3O+ that has a pKa value of -1.7. That means that hydronium is 1e52 times more acidic than an alkane hydrogen and 1e45 times more acidic than an allylic hydrogen. 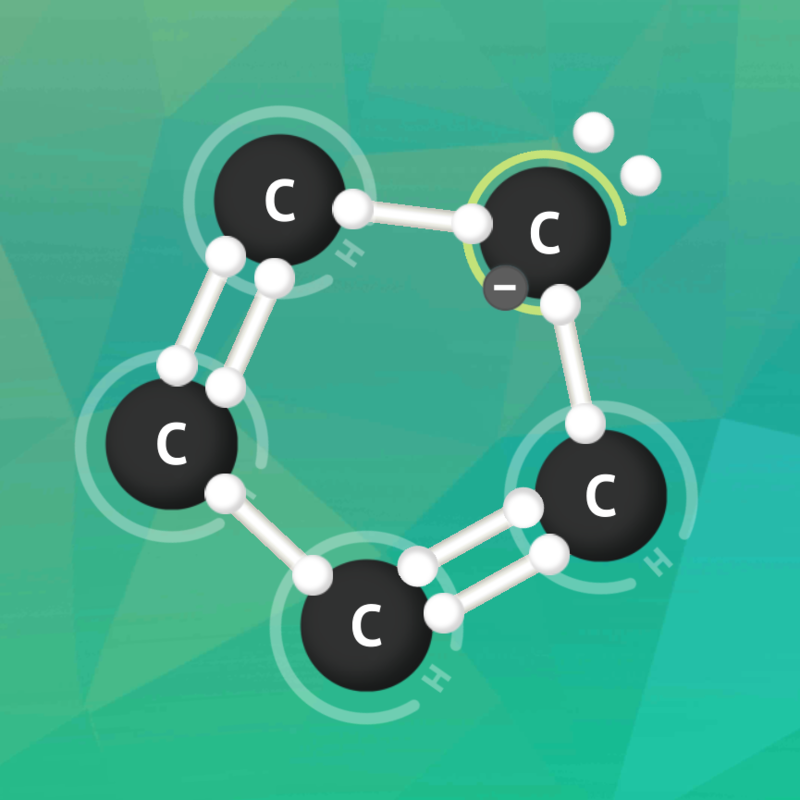 Ask students to give initial impressions about why cyclopentadiene, which lacks any electron withdrawing groups, would be in the acids/bases pack. Tell them that the pKa value of the hydrogen atoms attached to the sp3 carbon in cyclopentadiene is 15. This means cyclopentadiene is 1e35 to 1e28 times more acidic than alkane and allylic alkene hydrogens respectively. Work with students to use Mechanisms to extract this methylene hydrogen. At this stage, ask students to reason in groups about the geometry of the carbon bearing the negative charge. Invoke VSEPR theory to predict that this should be trigonal planar with the lone pair of electrons in an unhybridized p-orbital. Tap on the carbon bearing the negative charge to swap the representation to highlight the lone pair and to de-emphasize the hydrogen atom and emphasize that the negative charge on carbon is due to a lone pair in the unhybridized p-orbital aligned to the existing pi system. Ask students to consider why this structure might be stable. It is very likely that they will invoke resonance to explain stabilization, but remind them that allylic protons have a pKa only around 43. So while this does stabilize allylic protons relative to sp3 protons, it doesn't explain the pKa = 15 of the sp3 carbon in cyclopentadiene. 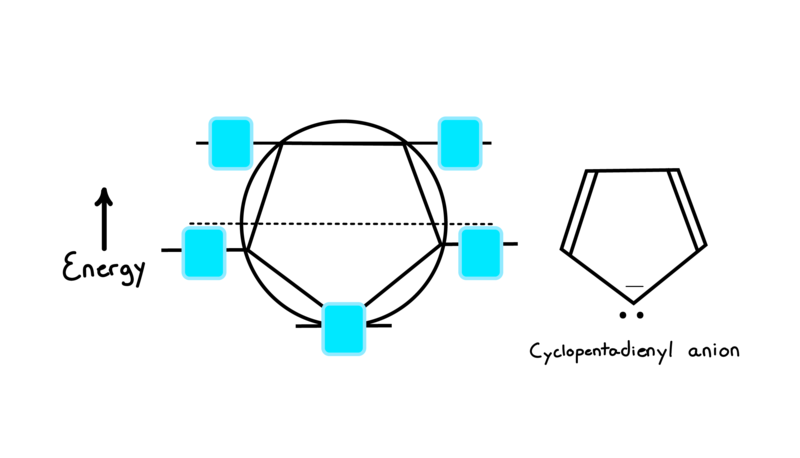 Introduce a Frost circle representation of the MOs of the cyclopentadienyl anion. 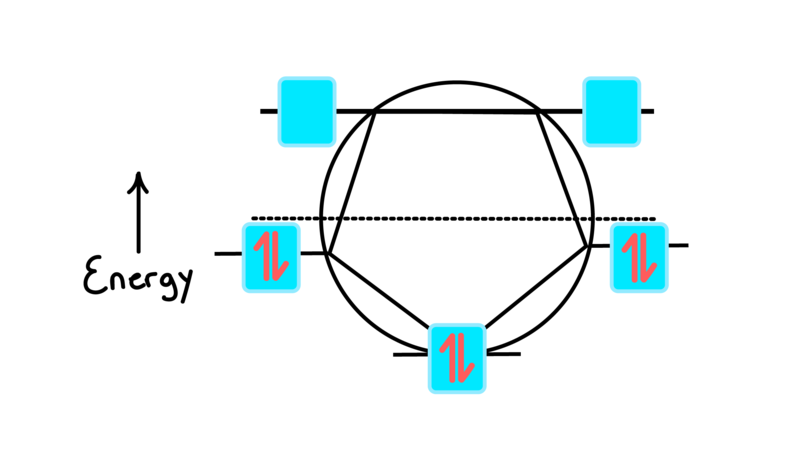 We selected this representation in this Flash Point because Frost circles bear superficial structural resemblance to aromatic rings, even though they are standing in as proxies for MO energy levels. Note: If students are unfamiliar with this representation, first provide some instruction to connect this representation to basic MO theory (bonding + antibonding orbitals) and more familiar ideas from general chemistry (Aufbau principle, Pauli exclusion principle, Hund’s rule). Explain that the dotted horizontal line of the Frost circle is a representation of what we might expect the energy of cyclopentadienyl anion to be just considering the energy of the atomic orbitals. The filled diagram, then, captures the reduction in energy when the MOs are filled. Conclude that cyclopentadienyl is aromatic and thus is stabilized by pi conjugation. Students should then be able to synthesize these representations together to justify why the hydrogen connected to the sp3 hybridized carbon in cyclopentadiene is around 1e30 times more acidic than similar alkane and alkene hydrogens. Ask students to justify whether cyclopentene would also observe a similar acidity. This activity asks students students to grapple with a big question “why is a alkenyl ion far more stable than would be expected?” and gives them a number of superficially similar representations to explain the pattern of results. Students must grapple with the fact that different representations of the same molecule afford different insights; only the Frost circle correctly invokes MO theory and the explanatory principle of aromaticity, which are both key to understanding the stability of this alkenyl anion. Two diagrams may look very different, but ultimately say the same thing. See how Mechanisms can get your students thinking critically about how arrow pushing mechanisms relate to electron movement. Using a diagram to justify an inference is something scientist do every day. 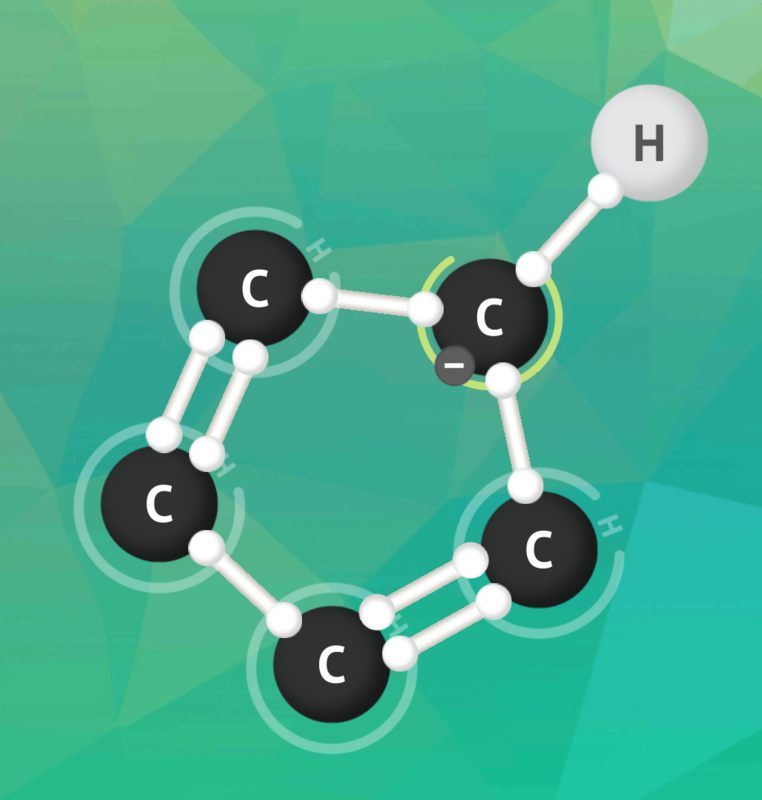 Help your students engage in this practice as they explore aromaticity, acidity in this Flash Point! "Learning all the ways that chemists draw molecules is like learning a foreign language. Exercise your students’ chemistry vocabulary and grammar with this diagram translation activity!" Chemists have developed their own symbolic language to communicate about what happens at the molecular level. Students need to learn this language and become fluent very quickly. See how you can use Mechanisms to help students translate between equivalent depictions of organic molecules that they're certain to encounter in class and their textbooks. It's not always obvious to students how structural changes of a molecule relate to more abstract concepts like energy. 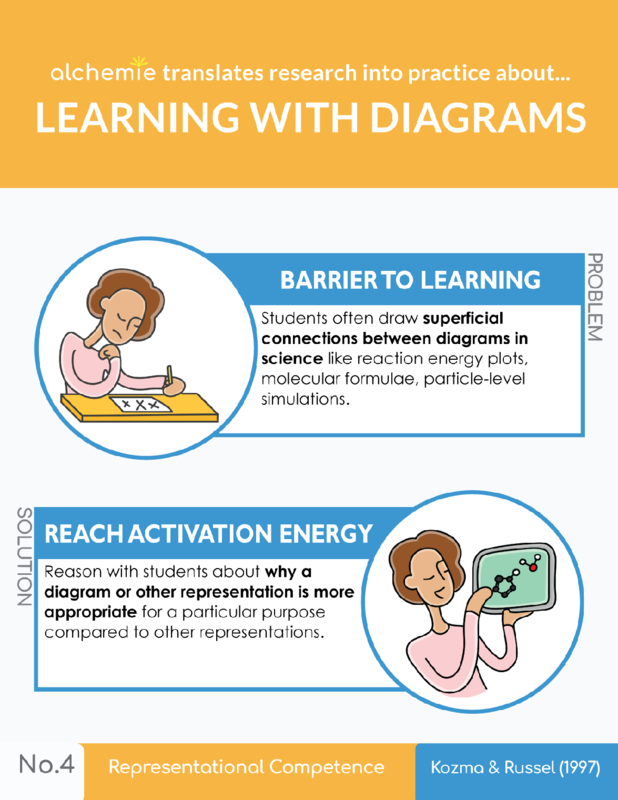 In this Flash Point we talk about one way you can integrate Mechanisms in your classroom to support students as they connect steps in a mechanism with energy coordinate diagrams.